San Diego State officials woke up Wednesday already feeling the pressure to deliver on a range of promises it, and its friends, have made to the community. Here are the top four we’ll be watching. Most of the time, when people put up measures to rival an existing ballot measure they don’t like, they’re just hoping all of them die. At first, that was what a lot of people assumed the Friends of SDSU were doing with what became Measure G. Their movement had grown out of a falling out between San Diego State University and the investors behind SoccerCity, which became Measure E. It seemed like killing Measure E was the top priority. But their effort to sketch out an alternative initiative that would benefit SDSU became a clarion call to the entire region. People heard it and came to support the university. The resulting show was a dramatic display of the university’s clout in the region – perhaps the first time we’ve seen such a demonstration of the quiet but fierce political power the institution has. It need only send up a flare, and the region will mobilize. But now it has won. Measure G will be law. The city and university are about to engage in an unprecedented negotiation to sell perhaps the most valuable but under-utilized pieces of public land in the region. And already the sneers that the university and city cannot pull off a deal this big have begun. University officials woke up Wednesday already feeling the pressure to deliver on a range of promises it, and its friends, have made to the community. Here are the top four we’ll be watching. The Promise: Build and maintain a river park. Measure G backers pledged SDSU would help create 90 acres of parkland, wildlife habitat and open space at the now denude stadium site, which is mostly a massive asphalt wasteland. The center of that plan would be a 34-acre park along the San Diego River. This park would not be able to actually touch the river, though, because of a buffer zone protecting the river channel and endangered birds that live in it from intrusion. But renderings show a low-lying park at the base of a newly created embankment filled with playgrounds and several ball fields and courts, as well as trails and greenspace. The university’s design consultant, Carrier Johnson + CULTURE, has said it designed the whole site around the river and the river park. There are questions, though, about who will pay for the park. The ballot measure prevents city general fund money from being spent on the park, but the city has other sources of revenue. 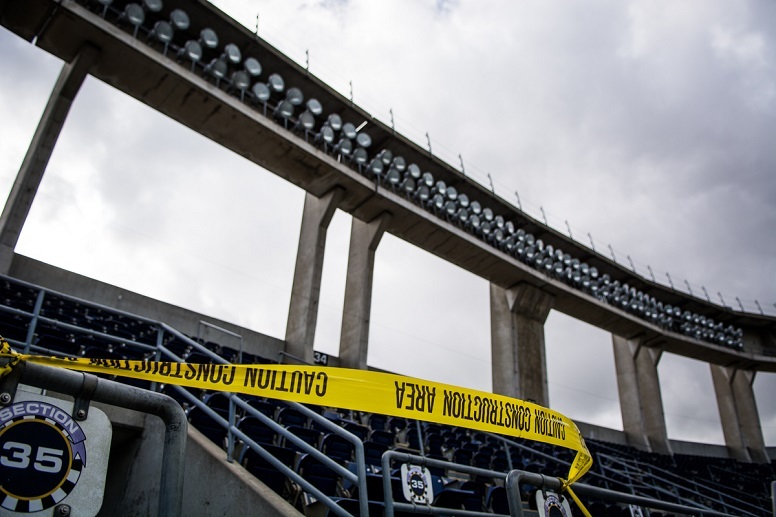 Some SDSU supporters have talked about using state grants to pay for the park, something that San Diego certainly could vie for with help from powerful supporters of SDSU in Sacramento, like Senate President Pro Tem Toni Atkins. The measure forces the city to sell 134 acres of the 233-acre stadium site to the university and says the sale “shall cause” a park to be built within seven years, but the park will be on land that the city doesn’t sell. That’s prompted the San Diego city attorney to worry the park will end up being a city responsibility rather than SDSU’s gift to the region. “The measure does not specify who would pay for, develop, build, or maintain a river park,” the city attorney’s office said in a recent analysis. The Promise: Begin construction in 2020. These are all big plans. Representatives of SDSU and its consultants visited Voice of San Diego in August to sell their vision for SDSU Mission Valley. John Kratzer, from JMI Realty, a university partner in the early stages of its effort, came with them. Kratzer made the expected timeline clear. There would be different phases of the project. “Think about four years of, of a phase one, you know, land acquisitions, infrastructure improvement, stadium construction, and 11 to 12 years of vertical from that point forward. The river park is phase one,” he said. In other media Wednesday after the election, SDSU officials indicated they think the university’s football team can play in the new stadium by 2022. It seems ambitious. But they’ll have several pressure points. The city extended its lease with SDSU at the old SDCCU stadium for two years past this year. The city loses millions on operation of the stadium every year and major repair projects will soon become vital. In other words, the city will be anxious to shutter the old stadium. Another lease extension would be controversial. The promise is ambitious but there’s a reason, and it could get ugly if it’s not hit. The Promise: Pay fair market value for the land. Though they regularly reminded the city that it had once gifted major tracts of land to the University of California for the creation of UC San Diego, SDSU officials and backers of Measure G promised that they did not expect the city to gift the land to the university. They would pay fair market value for it. That’s not exactly easy to determine, though, because ostensibly the market would determine the value as different suitors bid on it. Normally, the mayor would decide that a piece of property should be sold, go out and get bids on it and then ask the City Council for authorization. But that won’t be the case here. The measure directs the city to sell the land to San Diego State University. The city attorney’s analysis of how different this will be is interesting. But in short, the mayor is allowed to figure out the fair market value for the land and then include other things, like the obligation to build the river park and stadium. Then that becomes a purchase agreement. And the City Council gets to decide if that agreement is fair and equitable. So the university, it seems, has a lot of leverage in the negotiations. There’s another twist: Because of Measure E and the SoccerCity plan, the mayor sought out an appraisal of the land. It valued the land at $82.8 million. SDSU officials never accepted that number as representative of the fair market value they were willing to pay. “We would have to sit down and negotiate the sale of the property. We would come to the agreement what fair market value is,” said Gina Jacobs, a university vice president. City officials will face intense pressure to make sure a valuable city asset isn’t lost with little recompense. If they accept significantly less than the $82.8 million appraisal for Measure E, it could get tense. What’s more, much of the land is actually an asset of the city’s water department, which has obligations to use its assets to ensure water reliability for residents. The initiative requires that fair market value be determined as of Oct. 9, 2017. The biggest promise from SDSU supporters is that its whole expansion – a deal to buy one of the city’s largest tracts of land, build a brand new stadium, create a whole new research park, construct thousands of housing units and turn a parking lot into a park – can be done at no cost to taxpayers. The university has also said it will not raise student tuition or fees to pay for the expansion. So, the university’s been clear how it won’t pay for its expansion, but it’s not been terribly transparent about how it will. The stadium? “We just haven’t finished putting all of those numbers together,” SDSU’s athletic director, John David Wicker, said in September. It’s not like the university hasn’t been thinking, though. In its corner is JMI Realty and its CEO, Kratzer, who have experience with big projects, like the master plan that successfully redeveloped a huge part of downtown and built Petco Park. When it comes to the new housing and research space, the university is counting on private developers to lease and build on the university’s new land and then split the profits with the university. JMI expects the revenue from housing alone could help cover $300 million in initial expenses, including the land purchase and the river park. Even though there’s been talk of a market slowdown, Kratzer told us that JMI’s modeling assumed there would be a recession sometime in the next 15 years. Still, the university has at times had to turn to new student fees to help build or operate new projects, like its new student center. Not to split hairs, but even if all of the money comes from the largesse of the 23-campus California State University system, of which SDSU is a part, that’s still technically taxpayer or student money. If a state grant helps pay for the river park, that’s also taxpayer money. It’s all taxpayer money. But the question is whether there will be an increase in taxes or the price of tuition that can be traced back to SDSU’s expansion. It may take years to know. Measure G may have done more than give SDSU a big piece of land. It seems to have reinvigorated the SDSU alumni network. The university’s alums are already some of the city’s power players, but they seem to have rallied around the university as an institution, rather than just its football or basketball teams. That may open up wallets among those with money, or a glide path from politicians who in the past stood in the university’s way. Mayor Kevin Faulconer, for instance, was the former student government president at SDSU. Even though he backed SoccerCity starting last spring, he did so citing land he believed that project’s private developers had set aside room for SDSU to grow in Mission Valley. On Wednesday morning, hours after it became clear SoccerCity’s Measure E had gone down in flames, Faulconer threw his support behind SDSU. It will need all the support it can get to make good on these promises.